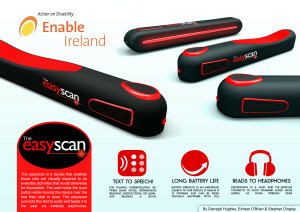 Description: The easyscan is a device that enables those who are visually impaired to do everyday activities that would otherwise be impossible. The user holds the scan button while moving the device over the text they wish to scan. The easyscan converts this text to audio and feeds it to the user via wireless earphones. Description: This team proposed two phone cover designs that incorporated different methods in increasing the access and utilisation of smart-phones by users with reduced mobility. This year’s competition involved a total of 29 students (Product Designers from DIT, Bolton Street and Nursing students from Trinity College, Dublin) and 6 Expert AT Users. Students from Purdue University in Indiana joined as observers for the final which took place in Enable Ireland on May 23rd. Each design concept reflected a keen understanding of the challenges which the Expert AT Users described in their daily lives. All of this underscores the value of students and users collaborating to find solutions to real world problems. Leckey, the competition sponsors were struck by the value of this coloration and are fully supportive of this approach to design solutions.